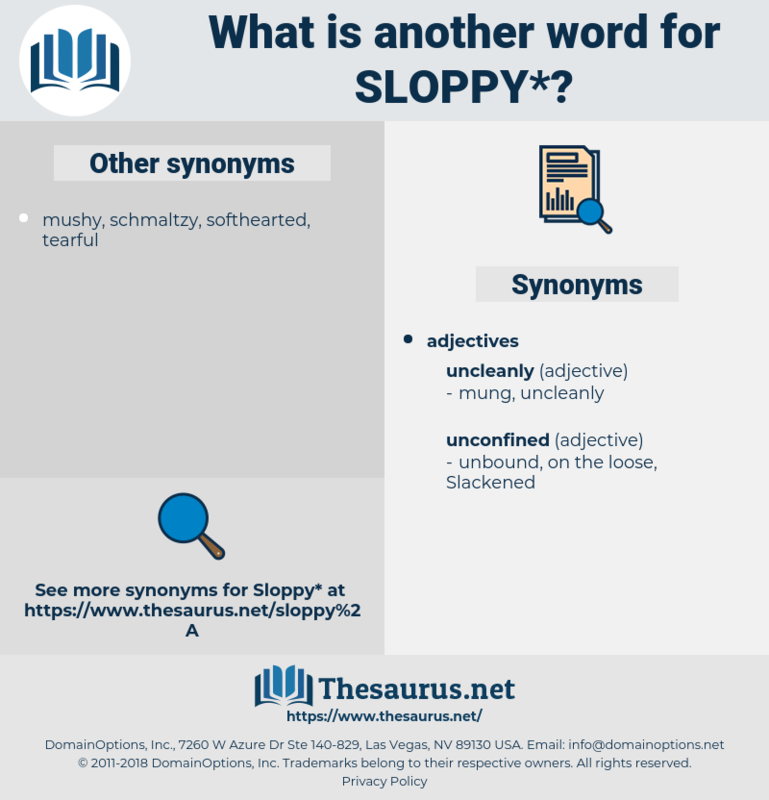 What is another word for sloppy? Wet; unpleasant because wet; as, sloppy weather; wet enough to splash water up on one; as, sloppy streets; colloquially, disordered and dirty. shabby, lousy, dirty, stupid, filthy, lame. careless, negligent, neglectful, disorderly, messy, disordered, sentimental, clumsy, remiss. clever, tidy, graceful, neat, dexterous, orderly, superior, clean, adroit. cleanly, bandbox, finicky, Manicured, wholesome, spotless, undefiled, well-ordered, dashing, unsentimental, kempt, unpolluted, neatened, dolled up, unadulterated, regular, unvarnished, cleaned, methodical, cynical, hardheaded, systematic, unsullied, hard-boiled, sparkling, immaculate, unsoiled, organized, ordered, spick-and-span, combed, untainted, hygienic, fastidious, systematized, stainless. Then came the rain, and the result was that the lawn of Myrtlewood became too sloppy for the most ardent devotees of croquet; indeed, as Bessie said, the great charm of the sport was that one could not play it above eight months in the year. My Connecticut girl was big and sloppy, a long - drawn - out person, such as is never, never gifted with a big voice. silvia, shelvy, sick leave, sylva, sell up, slope, salve, self, salvia, slip up, shlep, sexual love, slob, selloff, shelf, sell off, soil pipe, syllabub, slippy, slip-up, slip, sillabub, slaphappy, slipway, saliva, sulfa, social phobia, slip off, sleeve, sea scallop, sleep off, silva, slav, shelfy, salp, scalp, solve, syllabify, slip by, solvay, sclaff, skylab, slave, salpa, slub, schlep, slab, slap, sleep, sloop, scale up, salvo, seal off, school phobia, sylph, scale leaf, scollop, sulpha, slow up, slip away, shelve, swell up, solfa, scallop, slap-up, swallow up, sleepy, selva, schoolboy, slop, sea wolf, ski slope, slavey.